The vernal equinox is upon us, which means it’s time to start transitioning to spring. I bought this jacket years ago and despite the fact that it’s short-sleeved, metallic, and patterned, it’s very useful. Perhaps I have it all wrong, and the jacket is useful because of these qualities. It can be worn over a sleeveless dress or a blouse. It would probably also look cute with wide-legged trousers. But not skinny pants which would be too . . . matador. (Note to self: Halloween!) 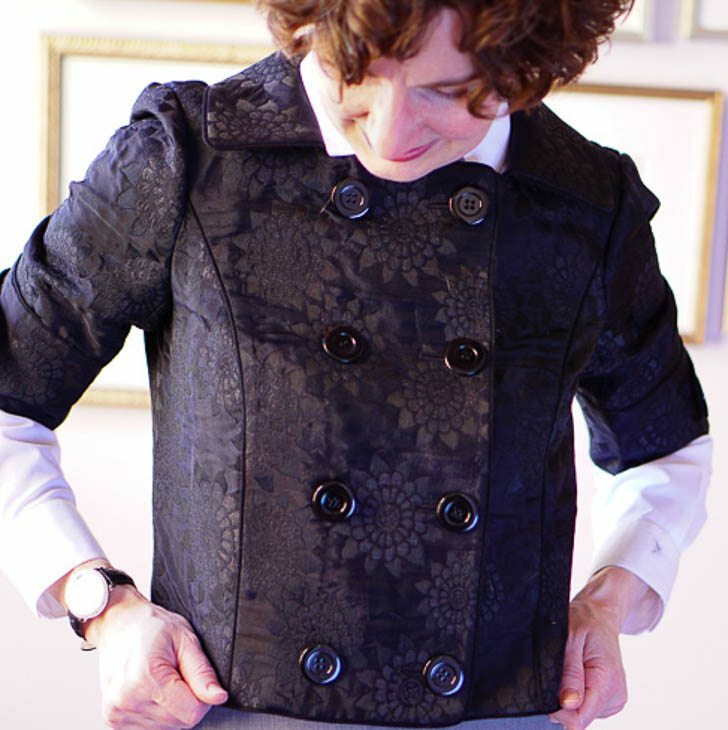 In addition to the buttoned tabs on the sleeves, it had tabs on the back that adjusted with a square buckle. The tab back was pointless and struck me as one embellishment too many, so I asked a tailor to remove it. Do you ever have the sense someone is watching you? The cherry blossom peak is (supposedly) just three weeks away! Perhaps I will exert myself and take a photo on location. The power of suggestion…..after viewing many of your cardigans, I found myself, on a recent shopping excursion, drawn to the sweater rack! And I was successful. I purchased a lovely Spring cardigan! It has a pleated fabric back WITH a small ribbon bow securing the pleat! I’m now packing for a trip & plan to review my belt drawer next, it may also need some refreshing!